Tony Moly I'm Real Pore Care Mask. 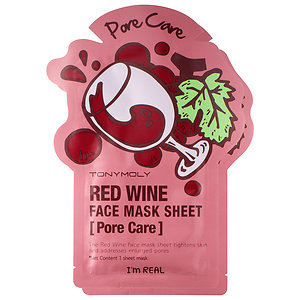 This sheet mask treatment is infused with real red wine extracts and rosemary to address enlarged pores while purifying, refining, and tightening skin. Perfect for troubled skin, it soothes the complexion with jasmine and green tea extracts for a refined complexion. Each mask features a three-layer durable cotton sheet for better absorption and deeper penetration of essence—resulting in a healthy-looking glow. Contains 1 mask . Product is Korean Beauty. Comes in: Red Wine.